Mechanisms of genome surveillance monitor and guarantee the integrity of genomic material and the accurate duplication of DNA before cell division. Any failure or misregulation of these mechanisms often lead to deleterious genetic disorders. Activation of these mechanisms is detected in early steps of tumorigenesis.  The 3R meeting (Replication, Recombination and Repair) has been for 24 years a unique opportunity for the French community and international colleagues interested in that topic to meet and interact. The success of the 12 first editions has revealed the great interest of the scientific community for this event. Almost 220 people have participated to the last edition in 2017. The 3R meeting aims at catalyzing collaborations between teams working in the 3R field but is also a fantastic opportunity for young researchers and PhD to meet and network early in their career. Deadline for registration (with abstract submission) is April 8, 2019. New deadline for registration (without abstract submission) is April 23, 2019. A discount of 200€ will be attributed to the first PhD students and post-docs who will register to the meeting. The number of awards will be communicated by the 3R committee in April 2019 according to our final budget. Please go to the "Abstract" section of this site to enter your abstract for a short-talk (15 min) or for a poster. There will be bus from Toulon to the meeting Center on May 21, 2019 at 2pm, arrival at Giens at 3pm. This corresponds to a train leaving Paris at 9:07am and arriving at Toulon at 1:13pm. For return, there will be bus leaving the meeting Center at about 10:15am, arrival at Toulon at 11:15am. Corresponding to a train leaving Toulon at 11.48am and arriving at Paris at 4.18pm. The registration fees cover the access to the conferences, apartments as specified, coffee breaks and meals.